Airship has partnered with Radar, a location platform for mobile apps. Radar makes it easy to start tracking location data with their iOS and Android SDKs, and generate contextual events from this data using their different event types: Geofences, Insights, and Places. Radar sends location data to Airship using our server-side Custom Events API. Whenever location events are generated, Radar will send custom events and properties to Airship. This data can then be used with the Event trigger in the Automation workflow, which automatically sends messages to users when certain conditions are met. Enter the Radar property you want to trigger sending the message. Optionally trigger only when a specified property of a location is met. Each Radar location event has associated properties that may be used as filters. For example, you can choose to trigger an automated message when a user enters a Radar geofence (radar_geofence_entered) with a confidence property (radar_confidence) value of Medium. Complete the remaining workflow steps and save your message. That's it — you just used Radar data with Airship Automation! Because Radar uses Engage custom events and event properties, all of this data is available in Connect and Insight. 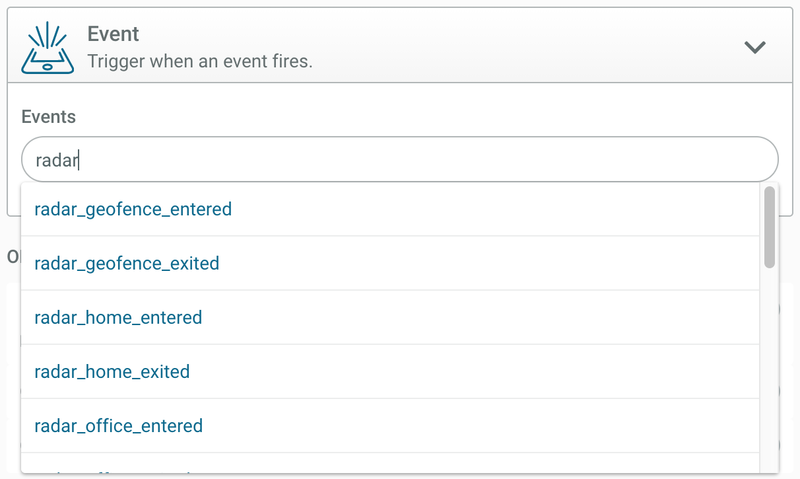 These events are also available in the Event Tracking report in the Engage dashboard.